I stumbled across you a few years ago and found your work refreshingly insightful and the joined the subscription service for the private blog. Though I am just your average middle-class citizen, I am glad that I now have a true picture of what the future holds while many of the sheep walk blindly into the future. Because of your willingness to share I have a general understanding of what is to come and will try to prepare as best as possible. My question is, Is there a book on a period of history that mimics what is going to happen over the next 21 years where I could maybe grab more insight into how the average person can best to position themselves so as not be left out in the cold? Are there any fictional works that nail the future so the average person knows what to do with savings accounts, 401K’s, mortgages, etc in the coming years? Lastly is there the possibility that you would write a special report that we could buy that would be the blueprint for the average American to follow over the next 21 years? I would sure buy it! Thank you for sharing your knowledge and well wishes for many years to come. ANSWER: There is no single book that I can recommend. I am trying to find the time to put one together for the sources are many. 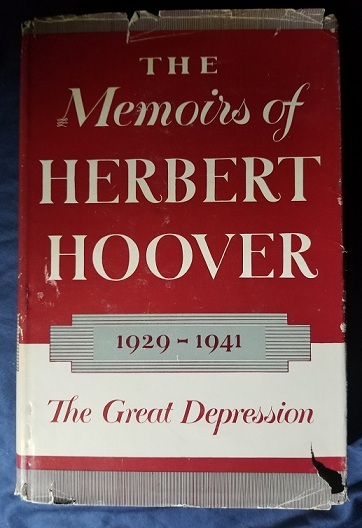 You can read Herbert Hoover’s Memoirs and I would recommend reading 1931. The problem has been that most of the books have been propaganda and have been written to support a predetermined conclusion. Most of my sources have been contemporary, gathering the facts from many sources and putting it all together. Nonetheless, we have provided a number of books you can look at digitally. It has been a lot of work and my time is so tight. I am trying to get this together soon.